FORMER President Robert Mugabe yesterday broke his silence and declared that he would not vote his Zanu PF "tormentors", particularly his successor Emmerson Mnangagwa while endorsing opposition MDC Alliance presidential candidate Nelson Chamisa as the only contender with the realistic chance of winning today's presidential race. Mugabe, who was dethroned during a military operation last November and succeeded by Mnangagwa, said he was still bitter over the way he was hounded out of office. Speaking to journalists at his Blue Roof mansion in Harare on the eve of the polls, the former Zanu PF strongman said: "I have never met Chamisa. I wish to meet him if he wins. I can't vote for those who've caused me to be in this situation. Mai (Joice) Mujuru (PRC presidential candidate) and Mai (Thokozani) Khupe (MDC-T presidential candidate) have less to offer, so there's just Chamisa." "As for whom I will vote. There are 23 presidential candidates in this election. I will chose from the 22 (minus Mnangagwa). I cannot vote for those who have tormented me, no I can't! We used to say politics directs the gun, but now the gun directs politics. I say no, no, no! "He (Chamisa) seems to be doing well," Mugabe said, denying speculative reports that he was funding the youthful opposition leader. "Let the people go and vote freely and I'm glad. Even Mnangagwa has said people will be allowed to vote freely and the result will be recognised, fine we appreciate that. I hope the voting which will be done tomorrow (today) will reform, will thrash away military form of government and bring us back to constitutionality." Mugabe said he resigned last November to avoid bloodshed. "Let tomorrow (today) decide, there should be a big no to guns directing politics. We shall never again experience a time when an army is used in politics. Congrats to whichever party wins the election and let us accept that verdict. Let's pray that tomorrow (today) brings us good news, good news to everyone is that we get our freedom back." Mugabe also opened up on how he intended to manage the Zanu PF succession issue, saying he had preferred former Defence minister Sydney Sekeramayi as his successor. He claimed he had planned to hand over power to Sekeramayi at last year's extra-ordinary congress, but the November military coup scuttled his plans. The 94-year-old Mugabe also denied reports that he had intended to anoint his wife, Grace as his successor. 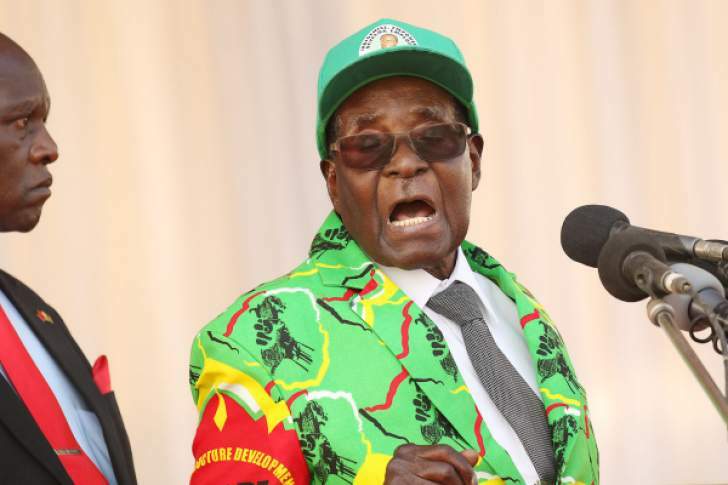 Referring to the coup, Mugabe said: "Why did a section of our people decide to go this way? In order to secure a position of leadership for just one person? Was there no better route? The Zanu PF, which I led, had scheduled an extraordinary congress for December 2017. I was going to resign and open our system. "So those who wanted to compete for leadership of the party and leadership of the country would do so, at that congress, I was going to support a candidate I had in mind. I had in mind all the time Dr (Sydney) Sekeramayi. "When Thabo Mbeki, former President of South Africa asked whom I wanted to take over after me. I said Dr Sekeramayi will be my choice. I had talked to Dr Sekeramayi and he was surprised. He said yes. "I was going to argue at that congress for people to choose? They (Sekeramayi and Mnangagwa) would compete at that congress. That did not happen. All the talk, all the nonsense you hear that the President wanted to leave his wife as President, all that nonsense it is utter nonsense. "So, hear it from me, I was sacked from the party I formed with others. I was regarded as an enemy. If the coup was to protect me, how come that I'm treated now as an opponent?" Mugabe said. But Zanu PF legal secretary Munyaradzi Paul Mangwana rubbished Mugabe's claims and justified his ouster, saying the former President had become an international embarrassment. "Robert Mugabe's age and health were failing him, leading to total disorientation to an extent he was not clear about which year, time or place it was. He was not aware of what he had read or not, what had been discussed or not, leading and all other issues of State that needed one to have the presence of mind to execute as CEO of our country. He was now a millstone on the neck of the people of Zimbabwe and an embarrassment at international get-togethers," Mangwana said in a statement. Asked about his opinion on Mnangagwa, Mugabe said: "He (Mnangagwa) was always a hard worker, but did not always tell me the truth. So I did not trust some of the things he told me." He accused Mnangagwa of lying that he had given him $10 million as pension yet he had only received $467 000 and an option to acquire two government-owned houses. Mugabe claimed he had always won the previous polls save for the March 2008 race where he lost to the now late MDC-T leader Morgan Tsvangirai by a small margin, leading to a run-off. He, however, denied opposition claims that the Zimbabwe Electoral Commission was captured by the ruling Zanu PF party.